Before we begin talking about what types of bombillas you can use, let’s first take a look at the origin of bombillas and why are they even necessary. “Bombilla” in Spanish and “bomba” in Portugese is a tool essential to consuming mate infusions. As with other brewed herbs, yerba mate leaves are dried, chopped, and ground into a powdery mixture usually called yerba. The bombilla acts as both a straw and a sieve. The submerged end is flared, with small holes or slots that allow the brewed liquid in, but block the chunky matter that makes up much of the mixture. Bombillas come in several shapes and can be made from several materials. The first bombillas were engineered by the Guaraní tribe and consisted of a simple and straight tube made from Taquara plant. In the 17th and 18th centuries, craftsmen who worked with the Jesuits developed the first metal bombillas. They utilized brass and alpaca for the simplest bombillas, and gold and silver to the most elaborate. The ones made of brass were known for overheating. In the beginning of the 19th century, as South America began to struggle to acquire it’s own sense of heritage, the habit of drinking mate made it’s way into the elite. Everywhere in the Region of the Plata, the ladies got together to chat and drink mate with milk. At the time it was believed that drinking mate with milk helped improve lactation. It was also around this time that the first high-end bombillas began to emerge, when the wealthy families ordered custom bombillas decorated with diamond, gold and rubies. The modern day bombillas can be classified by their shape and by their material. This is perhaps the most widely used shape. It resembles very much the contour of a spoon with orifices on both sides. Although it looks tempting to do so, you should avoid scraping your mate with a spoon bombilla, as doing so could lead to clogging. These bombillas are more pressed down than the others and the infusion goes through a series of horizontal slices. This type of bombilla seems to clog less than the others, making it ideal for newbie materos. This type is characterized by it’s spring shaped filter. It is also known to clog less than the spoon and circle shaped bombillas and is therefore recommended for newbies or simply those who want a smooth flow to their mate. Sipping mate through a coil-filter straw is a little bit easier but tiny pieces of leaf can get through the filter. This type of bombilla filters the infusion through small orifices very much like the spoon shaped one. The filter resembles a small metal globe. In general, it is important to note that the flow depends on the quality of the bombilla. Some bombillas have more than one type of filter, for example they may have a spring filter with a metal mesh underneath it. The more effective the filter, the more likely it is to clog up. When choosing a bombilla for a smaller gourd it is important to notice the distance in which the holes are placed. If they are too far, some infusion will remain at the bottom of the gourd which in a small container might matter. Bamboo bombillas are usually used for drinking cold mate (tereré). They are fairly inexpensive, but not very efficient. They usually tend to let some leaves through or will almost always clog up on you. The only advantage of this material seems to be it’s price and the fact that it does not easily conduct heat to your lips. This is material is also fairly inexpensive and widely available. Stainless steel bombillas are the market standard. They don’t rust and are resistible enough. It may sometimes also be mixed with other alloys, like bronze. Nickel bombillas are pretty strong and fairly inexpensive. The only problem with nickel is that it tends to rub off with time. It is also known to cause allergy to some people. Silver is the material of preference when manufacturing luxury bombillas. It not only looks great, but is also extremely durable. 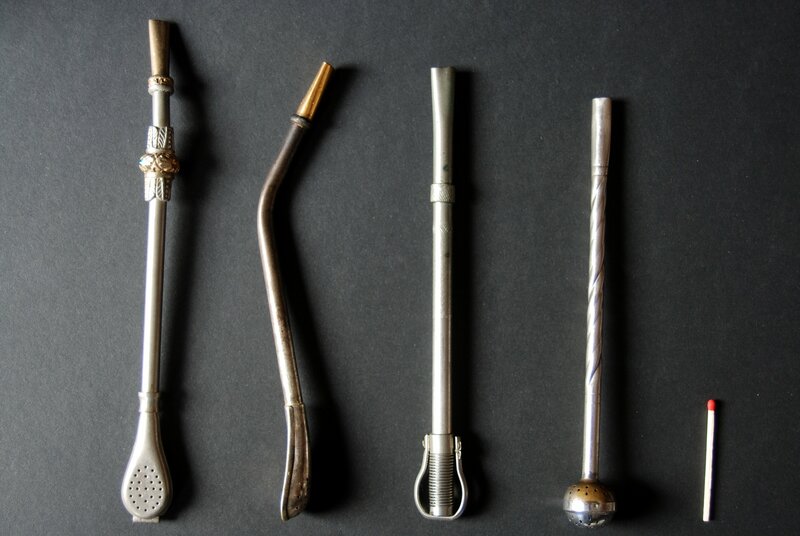 Many silver bombillas are combined with gold in the mouthpiece region. In the past, it was believed that gold could kill germs.